The Lloyd Sealy Library is a welcoming place for research, study, and reading. 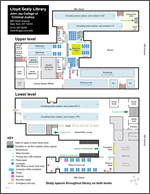 The Library entrance is on the lower ground floor of the Haaren Hall (T building). Enter at the Tenth Avenue entrance (between 58th and 59th St), take the escalators downstairs, make a U-turn, and enter through the security gates by showing your John Jay ID. When you do research for your classes, you shouldn't hesitate to ask a reference librarian for assistance. Determining which resources you should choose, knowing how to search them, and being able to incorporate the newly found information into your paper are skills you will need to learn. Becoming a savvy researcher may take a while. In the meantime, you can count on the reference librarians to guide you through the research process. When searching the catalog OneSearch, in addition to the call number, note the section where the book is located in the library. Stacks: the main circulating collection of the library. On the north side of the library: call numbers A–H are on the upper level; call numbers J–Z are on the lower level. Stacks books can be borrowed for 4 weeks by undergraduates and staff, 6 weeks by masters students, and 8 weeks by doctoral students and faculty. They can be renewed online. Reference: upper level of the library, towards 11th avenue. Not circulating (can't borrow outside of the library). Law Reference: upper level of the library, towards 58th street. Not circulating. 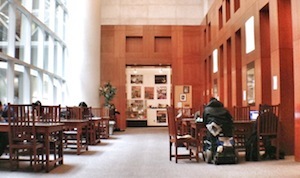 Special Collections: upper level of the library. Ask at the Reference Desk. Not circulating.